This shower curtain is designed and produced by well-known German brand Kleine Wolke, established in 1968, and is backed by their quality guarantee. A luxury, quick-dry and easy-care polyester fabric, as used in many high-end hotels. 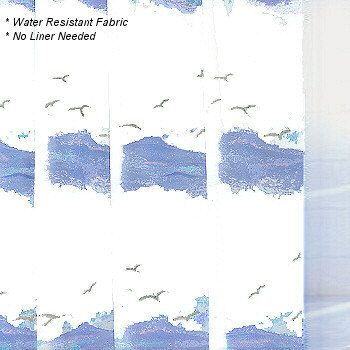 Our Seaside shower curtain features an elegant, flowing polyester shower curtain. The design shows rough seas with seagulls flying just over the waves. Vita Futura offers the Seaside design in your choice of two colors Terracotta with a hint of pink or Blue which also has pink and teal and three sizes shower stall - 8 eyelets, tub - 12 eyelets and extra-wide - 16 eyelets. SIZE ALERT - Our 16 eyelet extra wide Seaside is 70.9 inches in height.